Megan Fallwell, the USMMA Registrar for many years, has stepped down because of time commitments. We have another USMMA member who has volunteered to take over this critical position. Our website and the UC Davis genetics lab materials have been updated accordingly. We are looking to train an associate Registrar as well as one of our goals for 2018 is to be at least 2 deep in every position. If you are interested in learning more and volunteering to learn our registration process, please contact me for more information. Below is some information about Randy. We are fortunate that Randy is a computer whiz as our on-line pedigree database, powered by WIKIHORSE has decided to go off-line unexpectedly and without warning recently. Randy is working on creating our own system as he learns the registry position Our data integrity and reporting will improve immensely by the time we are done. We still have our USMMA pedigree database but not on-line. So, for a temporary on-line solution, we are also working to update http://horsemanager.com from our registry database information for pedigree look-up capability. Because WIKIHORSE disappeared, we did lose a lot of the photos you have sent in of your horses. We would love to get new photos too. Please welcome Randy into his new role. Thank you Megan for your service. And thank you Randy for stepping in. Randy was born and raised in the central California valley. Attending UCLA’s Electrical Engineering School, Randy Completed his BS, MS, and PhD degrees with a primary focus on Semiconductor Physics. While working on his Masters degree, he hired into Hughes Aircraft as a summer hire, eventually becoming a fellowship employee, and thereafter continued to work for Hughes and its successive companies, Hughes Electronics and Raytheon. Randy worked on airborne radars, missile seekers, GPS, and other defense systems. While at UCLA, Randy met his future wife Karen Livesay, (though he did not not know at the time) through friends in the Greek system. They did not see each other for many years after college and later reconnected, and have been married over 35 years. He and Karen fostered two boys for 11 years. In 1997 Randy and Karen decided to move to Sedona AZ. Randy retired from Raytheon in 2011. After retirement, and Randy and Karen started to travel around to world to bucket list places such as London, Paris, Africa, Dubai, Rome, Prague, Budapest, Alaska, New Orleans, Pagosa Springs, Istanbul, Greece, Croatia, Brazil, China, Russia, and many others. 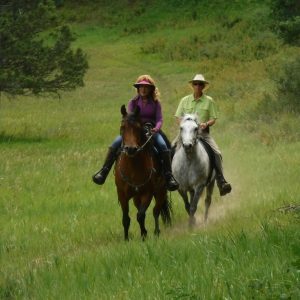 Randy and Karen are starting to slow down the foreign travel and enjoy their horses and pets and retirement lifestyle. 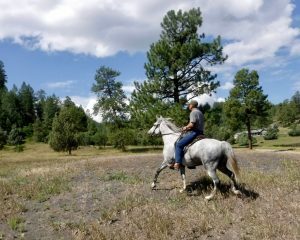 Randy decided a new challenge and education was in store, by learning to ride, train, and understand Karen’s horses. He now is riding Karen’s sweet natured Mangalarga Marchadors and telling Karen how she should train them (not the wisest move to a woman who has had horses since childhood). At first Randy couldn’t even say Mangalarga Marchador, instead referring to them as a Maquiladora Margaritas. He likes the breed for being wonderful athletic companions with strong, exotic and graceful looks. Randy likes to hike and bike, and volunteers with the local Boy Scouts of America troop in Sedona as an assistant scoutmaster, and the First Robotics Competition in Phoenix Arizona as a robot inspector and Workshop coordinator. Karen and Randy own 3 Marchador horses : Flying Oaks Pegasus and Jorge-Ben de Lazy T, MM geldings and Isabelle do Great Lakes, a MM mare.